You decided to spend your sailing vacation in Italy and now you need to plan your trip! Our selection of top 5 bases can help you choosing the right ones. The "Italian Saint Tropez" has several luxury hotels. The old center is located north of Corso Matteotti, the main strip. San Remo hosts several sailing events, such as the International San Remo Regatta in April. It is best known for its annual San Remo Music Festival. San Remo is located on the Mediterranean coast of western Liguria in north-western Italy. It was founded in Roman times. It is the best known tourist destination on the Italian Riviera. 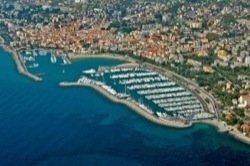 The city enjoys extraordinary weather conditions throughout the year since it is close to the Mediterranean Sea while the Maritime Alps are located right behind San Remo. San Remo's climate is often described as 'perpetual spring', with warm days and chilly nights and pretty much constant temperature around the year. These conditions make this destination one of the most attractive yacht charter base on the Italian Riviera. Rapallo is situated in the beautiful Gulf of Tigullio, not far from the famous Italian village of Portofino. The yacht charter base is completely restored and now features modern facilities. The new restaurant is besides good food, offers beautiful panoramic view of the gulf. Yacht charter base Rapallo is part of the Tigullio Gulf and is located in between Portofino and Chiavari. The local climate is moderate and the town is protected from strong northern winds thanks to the hills that rise immediately behind it. The area of Rapallo is included in the Parco Naturale Regionale di Portofino, which encompasses the territory of six communes. Rapallo dates from the 8th century BC and has many sights, the most important being the 1551 Castello sul Mare (Castle-on-the-Sea) with a small chapel dedicated to St. Cajetan, built in 1688 and the Castello di Punta Pagana, the seat of the Sovereign Military Order of Malta, finished on July 28, 1631. The yacht charter base is located in one of the most beautiful stretches of Sardinian coast. It features a combination of excellent infrastructure and the beautiful surroundings which makes it an ideal berthing place for yachts. Just a few miles away lie numbers of stunning islands, which makes the marina a fantastic set off point for sailing in the area. Porto Rotondo is a luxury seaside village. It is located near Olbia, on the north eastern coast of Sardinia. It's known for its glamourous social life and is popular among many celebrities. Porto Rotondo was named after a natural inlet of the Costa Smeralda which forms almost a perfect circle. The Piazzetta San Marco is the heart of Porto Rotondo. It is dotted with chic boutiques and fashionable bars. From here charming alleys branch out to the rest of the village. Porto Rotondo's main sights are the amphitheatre, built entirely in granite rock, as well as the splendid church of San Lorenzo, designed by the artist Andrea Cascella, with 200 wooden statues representing sacred scenes. 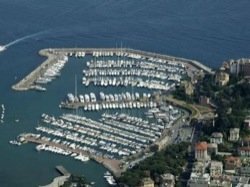 Gaeta is located halfway between Rome and Naples and is one of the safest anchorages in the Tyrrhenian Sea. This is the best yacht charter base for those who would like to visit the Pontine Islands. The marina hosts regular sailing events. 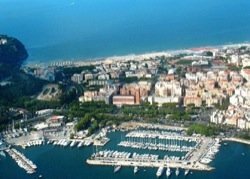 The charter base is located close to the old town and shopping area of Gaeta and just opposite the old Borgo di Elena, which used to be the maritime and rural neighbourhood of the town. Borgo's picturesque Via Indipendenza is popular street among the visitors of the marina for walking and shopping. The street has a comb- like structure characterized by terraced housing and narrow alleys perpendicular to the coast. It is paved with an old pavement known as basoli, made with large irregular stones that remind of ancient Roman streets. Borgo's alleys run fromn to the sea to what were once the town's market gardens. This makes Via Indipendenza perfectly sheltered from all winds and preserves its old-fashioned charm. Naples is the capital of the Campania region, between two volcanic regions, Mount Vesuvius and the Campi Flegrei. It is the third most populated Italian city. It was founded between the 7th and 6th centuries BC by the Greeks, and its historic center is a UNESCO World Heritage Site. Naples has one of the biggest historical city centers in the world with 448 historical and monumental churches. 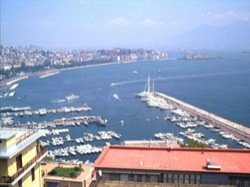 The islands of Procida, Capri and Ischia are all easily reached from Naples so if you decide to sail in Italy, Naples is one of the best charter bases to start or end your sailing trip. Sorrento and the Amalfi Coast are situated south of the city. However, what makes the surroundings of Naples really interesting are the Roman ruins of Pompeii, Herculaneum and Stabiae, which were destroyed in the eruption of Mount Vesuvius in 79 AD. Naples is synonymous with pizza, which originated in the city. Local, neapolitan, music has been very influential. It is connected with the invention of the romantic guitar and the mandolin, and has contributed to opera and folk standards.